Small businesses are strong contributors to the local Erie economy; it's fortunate that rents are relatively low here and opportunity abounds for entrepreneurs. But small business is not all about buying and selling. Many of these independently-owned companies are aligned with the arts, which is even better for all the creatively-minded folk who live here — and there are many. Embracing the burgeoning Erie art community, Artlore Studio is one of the few places in town where everything for sale is made by a local artist. Artlore Studio is a one-of-a-kind spot that draws people together. Some come seeking eclectic purchases or the opportunity to make art. Others want to learn at the classes they have to offer for both adults and children. And still more Erie residents want to use the space for events, when possible. Artlore is something else: It is unique in that the founders Stephen Trohoske and Lena Logvina encourage uninhibited creativity and imagination at their institution, inviting anyone with any artistic leaning to come in and express themselves. Because of this, Artlore is a community unifier, something Trohoske said they intended in the first place. "We opened Artlore because of our true love for art, music and community," he said, and the concept originated from "a passion to share our vision and our artists' visions within that community." True to his word, Trohoske displays exclusively the work of Erie-based craftspeople — a decision that will continue, thanks to the area's aesthetically-inclined minds which are continuing to come forth and surprise. Fortunately for the art world and its local representation, Trohoske is pleased to report that he has been a witness to many shifts and developments in Erie's arts community. "Art is always changing," he explained, "just like the times, so we try to keep our minds open to what someone has to say now," indicating that the nature of exhibits today are different from those in years past. "I grew up during a time of many art icons in Erie, so of course the impact they had on me helped shape my future choices in owning and running a gallery. We believe [the community] both changed and has been reinforced." The husband-and-wife duo of Trohoske and Logvina opened Artlore's doors in 2016, and things quickly grew from there. Its current location at 3406 W Lake Rd has been its home since May 2017, when the couple decided they needed more space and moved next door. 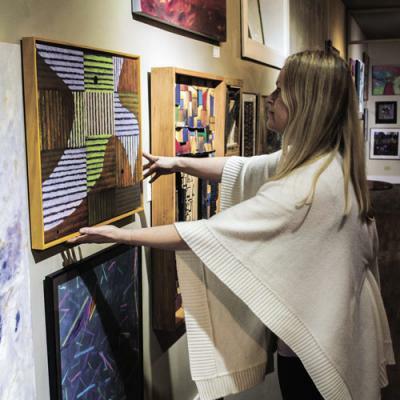 In the beginning, Artlore represented 30 Erie-based artists, now that number has stretched to more than 100, which speaks to the massive amount of art being produced locally and this team's desire to bring it all together. To further illustrate the point, Artlore's first digs spanned 750 square feet; now it occupies 3,500 square feet of space. With more room and more artists, the couple hopes to play an integral role in the growth of Erie's art community. And as a pillar of this world, Trohoske wants everyone in the community to strive to "develop good skills, educate [themselves], be constructively honest, forget about ego, support new artists and encourage each other to keep creating." Here's to Artlore acting as a catalyst for all this to happen.